paper does express insert from Strathmore Paper Co. in The Printing Art Suggestion Book (1916). During the decade that followed the merger of the Mittineague Paper Co. and the Woronoco Paper Co., the new Strathmore Paper Co. struggled to come up with a memorable advertising slogan. “Strathmore Quality” had become a familiar phrase within the printing world, but it was a tagline not a slogan. It was not unique as other companies boasted about their own quality. Strathmore needed a slogan that would both describe their particular lines of paper and distinguish them from their competitors. Although most Mittineague Paper Co. advertisements lacked slogans, there were at least two occasions where they were used. In 1901, one of their advertisements in The New England Stationer and Printer boasted, “If It’s Paper, We Make It.” It was a curious boast since it was patently untrue. Perhaps that is why it was so fleeting. Mittineague made fine papers for writing and printing; and papers for artists. It did not make newsprint, cardboard, security paper, blotter paper, or a host of other speciality papers. A much better slogan, “Beautiful Papers make Beautiful Books,” appeared in an advertisement for Strathmore Japan in 1908, but it quickly and inexplicably disappeared. In 1911 the new company tried to incorporate the tagline into a slogan: “The ‘Strathmore Quality’ papers are the pure stuff and not the bluff.” It may have rhymed, but it was awkward and deservedly did not catch on. “Strathmore Expressive Papers” advertisement in The American Printer vol. 62, no. 5 (March 5, 1916). 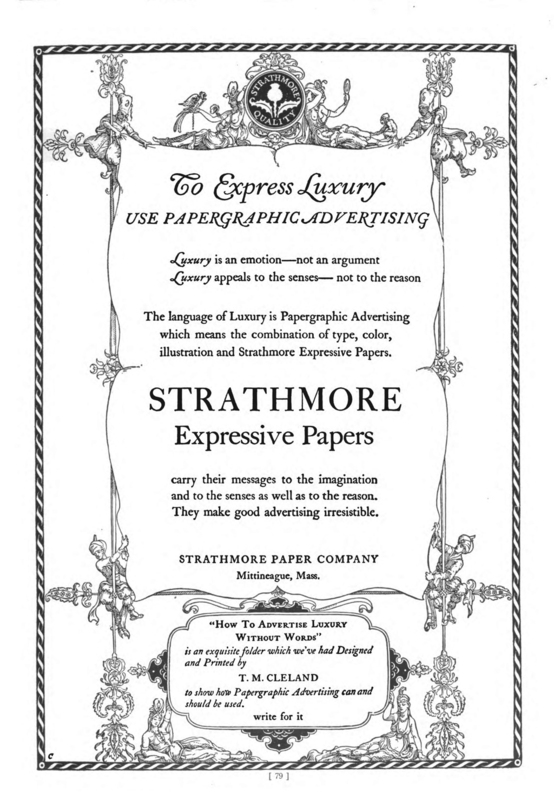 It was not until sometime in late 1915 that Strathmore came up with its first sustained slogan: “Paper Does Express.” It was the title of a “little demonstration booklet” sent out to printers and inserted in The Printing Art Suggestion Book (see top of post). But from the beginning Strathmore jumbled the phraseology, using “Strathmore Expressive Papers” in its advertisements touting the availability of the booklet and on the envelope of its first Suggestions mailer. 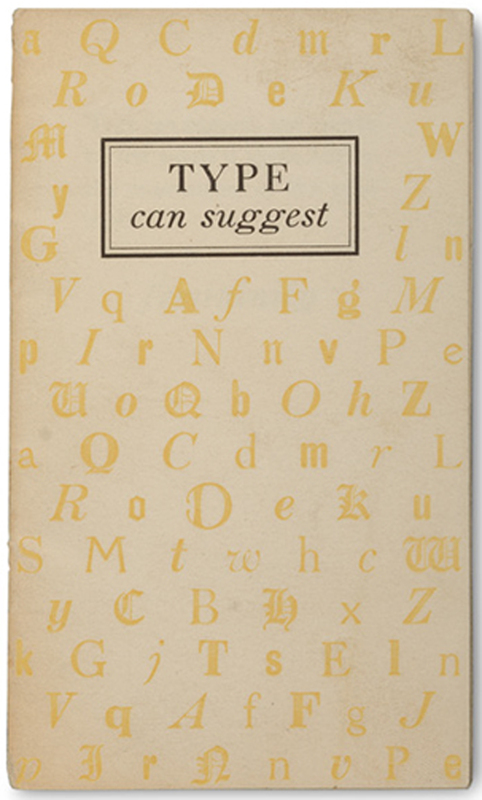 Type Can Suggest by Benjamin Sherbow (Mittineague: Strathmore Paper, 1916.). Design by Benjamin Sherbow. Photograph by Vincent Giordano. In Type Can Suggest, Sherbow said that, “Type can suggest not merely by the words it spells, but by the appearance of the type itself, such things as femininity, strength, severity, dignity, inebriety, antiquity, commonsense, cheapness.” The idea that the look of a specific typeface can suggest such things is commonplace now, but was radical one hundred years ago. Strathmore extended it to claim that the color, texture, finish, and weight of a paper could do the same thing. Through a series of six portfolio mailers called Strathmore Suggestions—the first sent out in late 1915 and the sixth in early 1917—they sought to back up their assertion with samples of paper bearing the names of qualities or states of being. 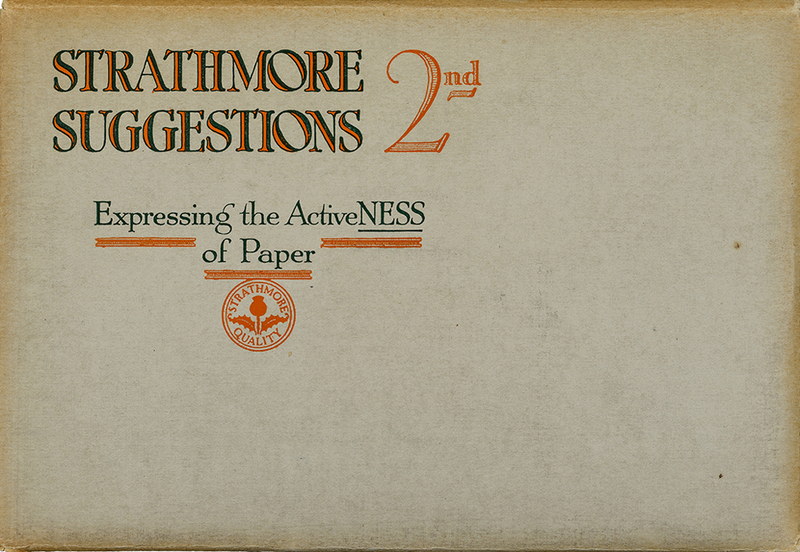 Strathmore Suggestions 2nd: Expressing the ActiveNESS of Paper (1916). Photograph by Vincent Giordano. Inserts from Strathmore Suggestions 2nd. Photograph by Ariel Smullen. A design which is to enter into printing is never complete in itself. The type with which it is to be combined and the stock upon which it is to be printed are units requiring the same consideration as the actual drawing. Usually the original drawing receives more attention than it deserves and is elaborated beyond all reason. As we know nothing of that spirit of craftsmanship which should encourage each man to intelligently contribute just the note which will best aid the contribution of his fellow workman, printing which is not prepared under the master hand of an individual is good only by accident. It may have the best drawing procurable, excellent typographical workmanship, and splendid presswork and yet be thoroughly inconsistent because of the lack of a proper relation of one element to another. Design and Typographic Display and the Use of Color on Strathmore Expressive Papers by Will Bradley (Mittineague: Strathmore Paper Co., 1917). Design by Will Bradley. Photograph by Vincent Giordano. 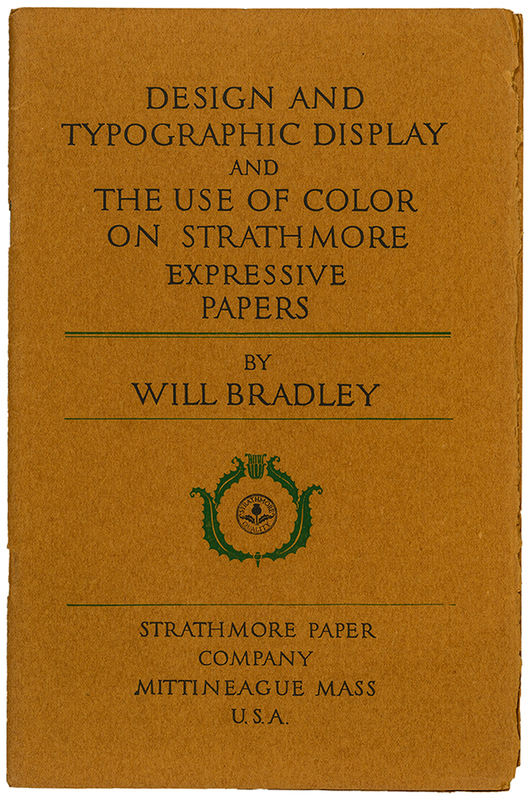 Strathmore followed up the Bradley pamphlet with The Language of Paper by Frank Alvah Parsons (1866–1930), a major figure in advertising and the director of the New York School of Fine and Applied Art (now Parsons School of Design). His monograph supported Strathmore’s slogan “Paper Does Express!” Parsons proposed three “qualification” ranges for papers: 1. elegance to cheapness; 2. vigor to weakness; and 3. friendliness to unfriendliness. The monograph came with a pocket of Strathlaid Booklet paper swatches, chosen for their color and texture, that exemplified the positive ends of each range. 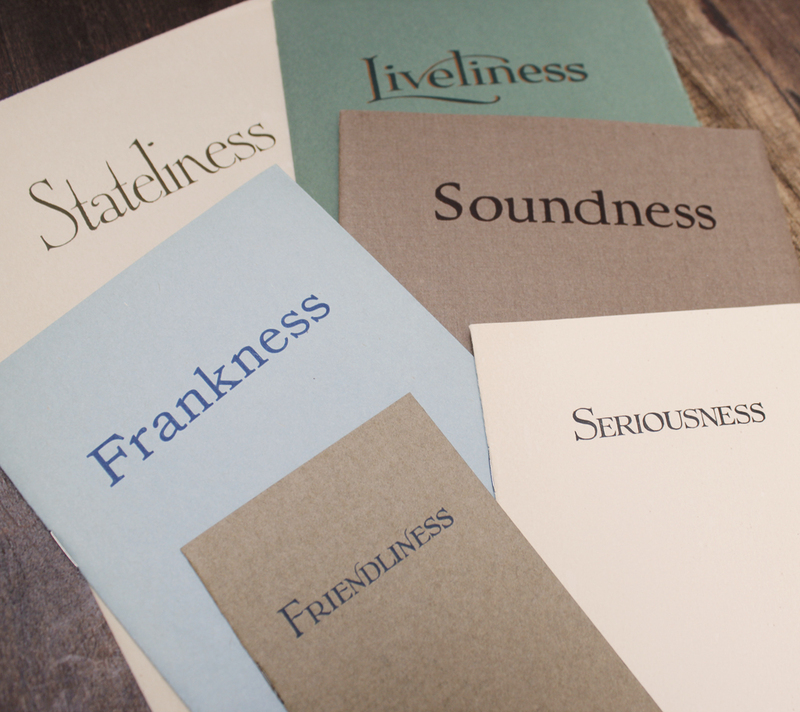 Strathmore’s attempts to label different swatches of paper as “frankness,” ‘liveliness,” etc. posed a potential dilemma. How was a printer supposed to tell whether a paper expressed seriousness or a similar sentiment such as dignity or stateliness? Parsons’ concept of qualification ranges solved the problem, but The Language of Paper was verbose and not visual. Strathmore needed to show printers the different expressive possibilities of paper. Following the end of World War I, the company did this with the “Papergraphic” advertising campaign. “To Express Luxury Use Papergraphic Advertising” advertisement in The Printing Art vol. XXXIV, no. 1 (September 1919). Design by T.M. Cleland. The Papergraphic campaign began with an advertisement that asserted, “Luxury is an emotion—not an argument. Luxury appeals to the senses—not to the reason.” To advertise luxury one needed the proper combination of type, color, illustration—and Strathmore Expressive Papers. To show printers what this meant, Strathmore commissioned T.M. Cleland to design and print a folding mailer (the first in a series with the label “The Art of Papergraphic Advertising”) titled How to Advertise Luxury Without Words. Ironically, Strathmore used words in the folder (printed on Alexandra Japan) to make its case (see below). It also continued the older “Paper Does Express” slogan. Detail of interior of How to Advertise Luxury Without Words (1919). Design and illustration by T.M. Cleland. Printed on Alexandra Japan. The Cleland mailer was followed in 1919 by Dignity, designed by Frederic W. Goudy, and in 1920 by three others (How to Advertise Daintiness Without Words, designed by The Reeses; Strength without Words, designed by Adolph Treidler; and The Craftsman Look). The latter, whose designer is unknown, is interesting for the manner in which its argument is slowly revealed as the mailer unfolds. 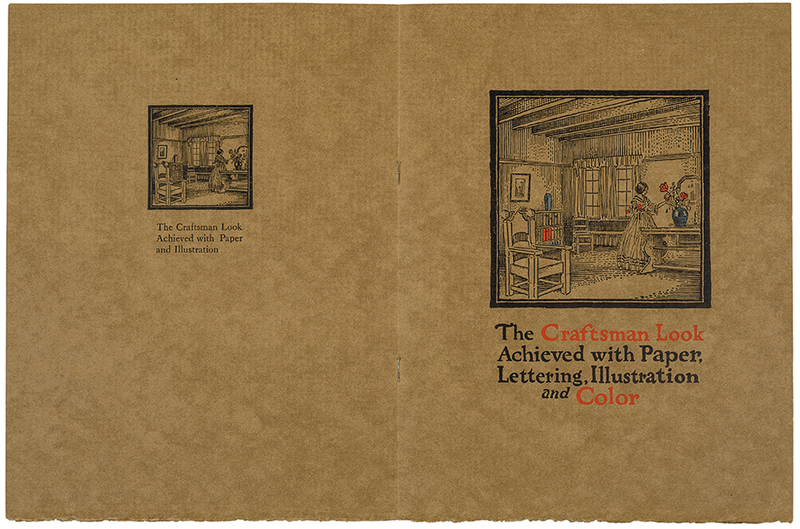 The cover says “The Craftsman Look”; the next panel simply says “The Craftsman Look Achieved with Paper and Lettering” in a rugged style of lettering; the following panel, showing a black-and-white woodcut-style illustration of a Colonial interior, says “The Craftsman Look Achieved with Paper and Illustration”; and the final panel, repeating the same illustration with a few spots of blue and red color added, says “The Craftsman Look Achieved with Paper, Lettering, Illustration and Color.” At the time this was the most sophisticated promotional piece issued by Strathmore. 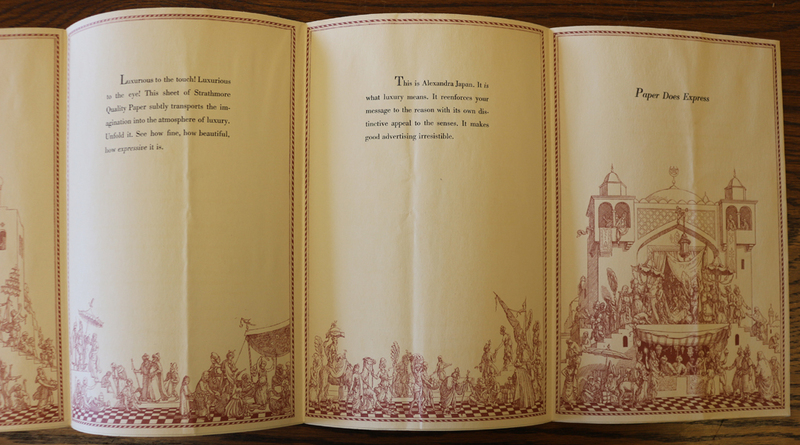 Spread from The Craftsman Look (1920). Designer unknown. Printed on Strathmore Bannockburn Cover. Photograph by Vincent Giordano. 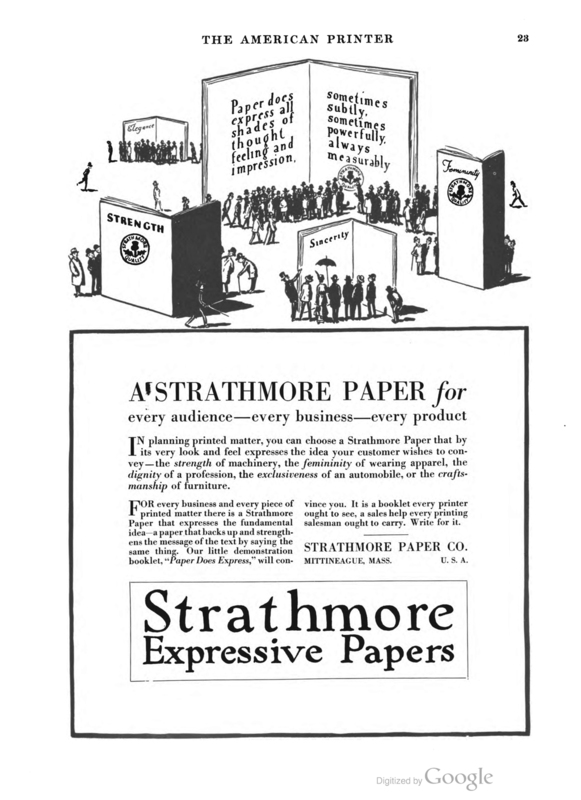 By 1920 Strathmore had found not one slogan, but three: “Paper Does Express,” “Strathmore Expressive Papers,” and “Papergraphic Advertising.” They all said the same thing, though in slightly different ways. That they were used simultaneously, and sometimes within the same advertisement or promotional piece, muddied their power. C.W. Dearden, head of Strathmore’s Direct Mail Advertising Department, must have realized this. Both “Paper Does Express” and “Papergraphic Advertising” were quietly dropped sometime during that year. 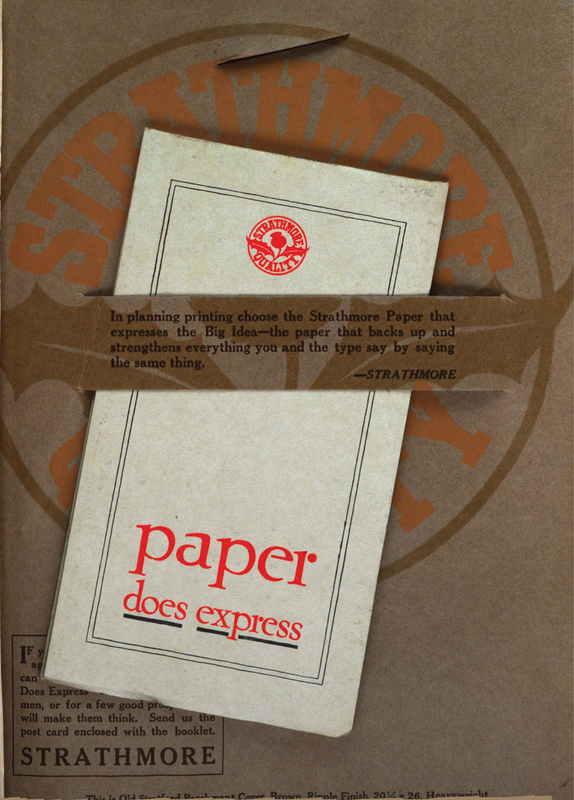 “Strathmore Expressive Papers” was retained as a tagline and in 1921 a new slogan was born to go with it.